2-Part Video Series On the Decline of the Earth's Magnetic Field and an Impending Pole Reversal - A Must Watch!! The Earth's Magnetic Field is experiencing a sudden and alarmingly fast decline over the past couple centuries. In this video we'll look at the nature of the earth's magnetic field, why its declining and what we can do to protect ourselves. You'll also understand that the Earth's magnetic field and its geomagnetic frequencies are an essential element of health. The Magnetic field of the earth does more than just protect us, it actually nourishes us energetically at the cellular level. Looking at this beautiful image, the Earths Magnetic Field (in the middle) is strikingly different then Venus (Top), and Mars bottom. This magnetic field is very complex and stratified and forms a vast protective cocoon sheltering planet earth from a vast amount of incoming and destructive cosmic radiation. But there is a Storm brewing that is weakening our magnetic field. The magnetic field that has been protecting the earth for 2 billion years or more, is now getting weaker at an alarming rate. Could the earth lose its magnetic field and what would happen if it does? There is a region of our planet that no human being has ever visited. It's a vast ocean of a billion trillion tons of molten iron with searing heat and crushing pressure. 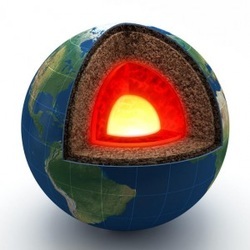 This is our earth's core buried beneath nearly 2000 miles of solid rock. And its still partly a mystery because the Earths core is inaccessible - immese spherical molten core of iron. Is the Core of our Earth Faltering? Says the Earth's Cores ability to generate the magnetic field is faltering. Something very strange is going on with Earths magnetic field. Its strength is declining fast. This is a Puzzle that is challenging scientists from around the globe. Its seemingly magical ability to attract and repel delights and baffles children and adults alike. Magnetism, like electricity lies at the heart of most modern technology from power stations to computers to toys and television. While we are constantly reminded by the pull of gravity we are oblivious to the other force the earth generates, the magnetic field. Space scientists know how important it is. Cosmonauts know too. It's Biggest thing on earth we have extending thousands of miles into space. The Magnetic field is Created deep in the earths core, it streams out near the south pole and loops around the planet and then runs back into the core near the north magnetic pole. This is the earth's protectic forcefield, and without it we'd be in trouble. The dynamo theory proposed by Albert Einstein and others depicts the earth as Self sustaining electromagnetic dynamo. There are vast Currents in the liquid metal outer core. The earth's core has a Moving conductor on the outer layer of its billion trillion tons of molten iron. And the magnetic field created by the more outer core produces the electric currents in the core. And the currents in the core produce the earth's magnetic field. The earths Magnetic Field is generated by this feedback loop between the outer core of the earth and its magnetic field. --- In short its a self sustaining Dynamo. This is the Dynamo theory in a nutshell and it remains the best theory we have to explain how the earth's magnetic field is generated, sustained and maintained. Without this nuturing and protective field, the earth would over time become a dead planet like mars and Venus. The earth lives in a highly energetic environment with intense radiation and charged particles bombarding it all the time. Space weather is nasty - the winds that blow through the galaxy are winds of intense high frequency radiation (gamma and cosmic rays). Some of the most harmful cosmic rays are from distant exploding stars. Much nearer is our sun which is a thermonuclear furnace and it flings off very dangerous material in very large explosions. Ever few hours the sun ejects billions of tons of electrically charged particles. THE SOLAR WIND and Often the earth lies directly in the path of this onslaught. But Earth's magnetic fields deflect these charged particles and the earth's atmosphere filters out most of the harmful radiation. This means that the solar wind is unable to penetrate the earth's magnetic shield. Like a well built house or bunker that shields you from weather, even hurricanes, the earth's magnetic field protects us from the suns solar winds and other space weather. These charged particles are bent into orbits that flow around the earth or at worst enter at the poles harmlessly around us. 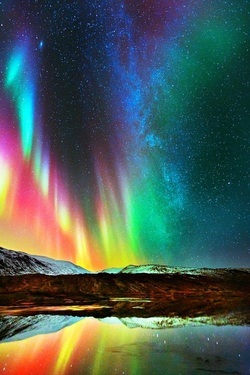 Northern Lights are evidence of the charged particles entering at the poles. What are the consequences of no magnetic field? Hidden in the history of Mars lay the connection between magnetism and life. There is evidence that mars was once a living planet with water and perhaps even complex life. In 1996 NASA sent a satilite to mars to test the magnetic field and other variables. Does Mars have a magnetic field? What NASA found was that the Mars surveyor sent back data - confirming that Mars has no magnetic field. But interestly Large areas of the surface were magnetic. If a strong magnetic field is present, volcanic molten rock can cool to become magnetic from iron based minerals. Magnetism in martial crust proves it must have once had a magnetic field and must have lost. In fact NASA found that the Martian magnetic field was once 20-30 x the intensity of the earth. A Young mars may have been earth-like with water and teeming with life. But according to NASA measurements, 4 billion years ago there was a catastrophic decline. The martial Oceans and atmosphere disappeared. If the earth's magnetic field disappeared, the same thing would happen, the earth would experience the erosional effects of the solar wind over time. Earth could also become a dead planet. Understanding the Earth's Magnetic Field History from Pottery ... YES! Our own magnetic field is fading so rapidly. Evidence of our decline from a surprising source. Archeologists study pots to learn about ancient cultures. But these vessels have another story to tell. John Shaw of the University of Liverpool made an amazing discovery studying Pottery...John Shaw has found how to extract a precise measurement of the earth's magnetic field at the time the pottery was made. Pottery acts like a magnetic tape recorder. Recording the earths magnetic field strength at the time its made. Pottery is like a Magnetic time capsule. 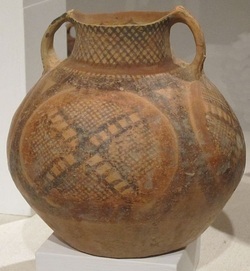 So if we take an ancient pot like this one, which is from Peru, when it cooled for the first time, it cooled in the Earth's ancient magnetic field and it became magnetized in that field. And of course, if the field's very strong, then the pot's strongly magnetized, and if the field's very weak, then the pot's weakly magnetized. Pot itself becomes slightly magnetic. When we plot the results from the ceramics, this is what we see: gentle changes as we come forward in time over twelve thousand years—a gentle rise—and then a rapid fall, as we come towards the present day. The rate of change is higher over the last three hundred years than it has been for any time in the past five thousand. It's going from a strong field down to a weak field, and it's doing it very quickly. 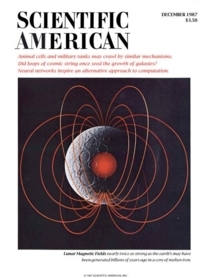 The May 1988 issue of Scientific American magazine details today’s ongoing degrading of earth’s once powerful magnetic field, which is now measured at only about 50% of its intensity several centuries ago. Scientists calculated if this degradation continues there will not be a sufficient magnetic field to support life within 1500 years. Last 300 years it has fallen the most. The Royal Navy also has detailed log books of the earth's magnetic field over the last 300 years which confirms further confirms this now almost proven fact. The earth's magnetic is DEFINITELY declining. Is the Earth's Core Cooling? Clue as to what may cause the field to decline. Moving liquid metal critical ---> if core cooled, than the dynamo would should down. Mars smaller planet and colder so it cooled off quicker. Will what happened to Mars happen to Earth? But the earth's core is declinging in temperature only 100 degrees per billion years. This means are core will continue burning for several Billion years into the future. 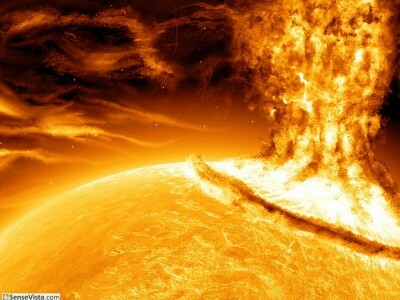 At least 2 billion years the earths magnetic field has existed and has inherited the hot liquid core from its inception. It has lasted so long because of this energy source. We should be fine for at least a few billion years in the future. Earth's field is decreasing way too fast to match any core cooling. Something else going on. But What? Clues for what is happening deep in the earth's core is found in the volcanic islands of Hawaii. 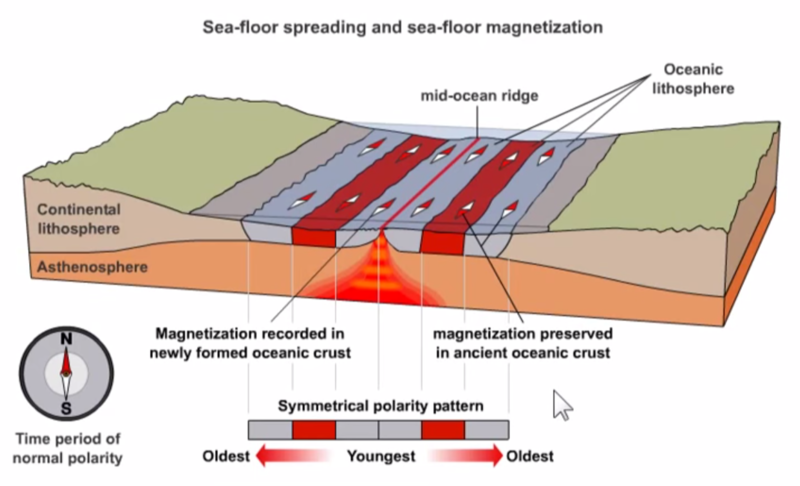 - record of the earths magnetic for millions of years. A record not of gradual decline, but a series of dramatic magnetic upheavals. Geophysicist. It all begins when lava hits the sea. Forms newest bit of island. Chills very fast and traps in and records earths magnetic field. Volcanos of Hawaii erupting for millions of years and building up the islands. This Preserve like a tape recorder the earths magnetic field history. Records stretch back over 5.5 million years. When lava cools, like pottery, it records how strong and what direction. Today runs from South to North. Compass points to North. 700,000 years, rocks are magnetized backwards. Magnetized to the South. Entire global magnetic field did a 180 degree reversal. Took 50 years to convince people, but now it is considered a fact that our earths magnetic field has been reversing direction around once every 200,000 years on average. But its been 780,000 years since the last reversal, so we are around 580,000 years overdue! Is an impending pole reversal why the field is growing weaker today? Glatzmaier, Gary A.; Roberts, Paul H. "A three dimensional self-consistent computer simulation of a geomagnetic field reversal". Nature 377. pp. 203–209. Intriguing problem… Computers solved convection in the core of the earth and how that motion creates the magnetic field. To see how magnetic field would evolve. Using supercomputers for over 4 years. Whenever it reversed, that happened when the field was very weak each time in the simulation. Reversals are heralded by a weakening field. Starts with magnetic anomalies where patches are going the wrong direction. South Atlantic anomaly began at beginning of 20th century - clear evidence of magnetic anomalies. Magnetic fields have reversed in a region which cancels overall field and weakens it. 780,000 years since last reversal. Complete flip of entire global field. A pole reversal is now longer a question of if, only a question of WHEN. Because its been 780,000 ... Noone has ever experienced one. What Will Happen During a Pole Reversal? Effect every person on the planet. More cosmic radiation at ground level. Overall exposure to cosmic radiation will double. Might be 4 or 8 poles moving across the earth. Field focus. Not catastrophic but it will be a challenge. few thousand years will not strip atmosphere. A world without a strong magnetic field will be able to see aurora every night. Also Magnetic Deficiency Syndrome, which is a recognized condition resulting from insufficient Earth Magnetic fields and frequencies. On December 4, 1976, the Japan Medical Journal (No. 2745) published a far reaching paper titled Magnetic Field Deficiency Syndrome and Magnetic Treatment, authored by Kyoichi Nakagawa, M.D., one of the world’s top authorities on magnetism and its therapeutic effects on the human body. He claims that the earth’s degrading magnetic field combined with mankind’s electronic environment is responsible for this “Magnetic Field Deficiency Syndrome”. Dr. Nakagawa found symptoms such as chronic pain and sleep disorders became magnified when the body tests too low for the earth’s pulsating electromagnetic fields (PEMFs). Japanese industrial workers who spend long hours inside metal buildings that block our earth’s natural magnetic field began to show the following symptoms: insomnia, decreased energy, dull aches, and general body pains. The installation of artificial magnetic fields alleviated these symptoms. Also fibromyalgia and chronic fatigue syndrome have been linked to a deficiency in the earth’s magnetic field. Do you suffer from a magnetic deficiency? The answer could be “yes” unless you’re already taking precautions to avoid it. Symptoms include stiffness of the shoulders, back, neck, lower back pain, habitual headaches, dizziness, general fatigue, and chest pains for no specific reason. From NASA and the Russian Space program to Zero field studies, its becoming more and more clear that the earth's natural Magnetic field and its frequencies (Schuamann Resonance), are an essential element, just like food, water, sunlight and oxygen. The earth is not just a static field, but it has a frequency too. The Earth's PEMF or pulsed electromagnetic fields. I outline and explain the Earth's natural PEMFs in my book. The approved devices include those that stimulate bone growth, support muscle function, enhance wound healing, reduce pain and swelling, and stimulate the nervous system to treat severe depression, and treat arthritis.I also explain that while static magnetics are good, but PEMFs are even better and actually more natural and effective as proven by over 2000 double blind studies, and over 10,000 peer reviewed papers. Its even FDA approved for pain, tissue swelling, bone fractures, and depression. With the decline of the earth's magnetic field and an impending reversal, investing in an earth inspired PEMF device may not only we wise, but essential as a survival tool because its an essential element. With 7 years experience helping thousands of people, I can confidently say that you will notice more energy, better sleep and less pain almost immediately using a PEMF device. 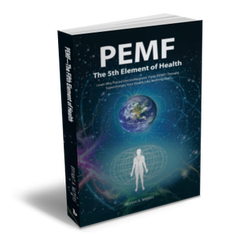 In my book I go into much detail on why the Earth's PEMF or pulsed magnetic field is essential, the research to support this, how PEMF works in the body and the many benefits it provides.